Vitamins for healthy hair, skin, and nails contain the same vitamins your entire body needs for growth and maintenance of cells. Hair, skin, and nails respond well to certain vitamins that support keratin production. Keratin is the protein that builds hair and skin. Your body produces millions of skin, nail and hair cells over the course of your lifetime. Every day, the body transforms raw materials from food into keratin, a tough protein that is the basic building block of hair, skin, and nails. Genetics may determine your hair color, how hair and skin ages, and the texture of each. Environmental factors such as exposure to tobacco smoke and sun, medication and drug use, and nutritional deficiencies may all be reflected in the appearance of your hair, skin and nails. Hair is actually an accessory structure of your skin as are your fingernails and oil and sweat glands. Skin is living tissue that forms the largest organ in the body while hair is non-living tissue that has the second fastest tissue growth rate in the body (the fastest is bone marrow). Because skin is living tissue, proper nutrition can affect it quickly, while hair may need to go through a growth cycle before you experience the full benefit of nutritional solutions. 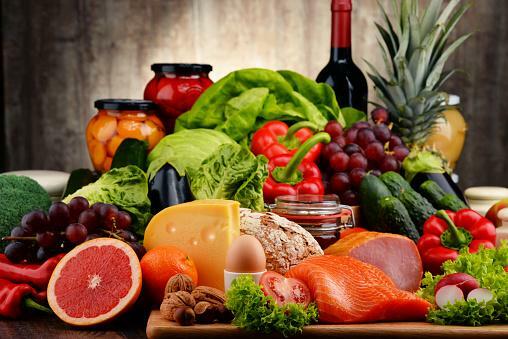 The best source of vitamins for healthy hair, skin, and nails come from eating a balanced diet that contains healthy foods and servings as recommended by the United States Department of Agriculture (USDA). Choose fruits and vegetables from across the spectrum of colors to ensure you get all the vitamins, minerals, antioxidants, and phytonutrients necessary for health. In addition, the following vitamins and minerals supplements can help improve the appearance of hair, skin, and nails if your diet is deficient. Dr. Ted Daly, a clinical professor of dermatology at Nassau University, states on the website Vitamin and Supplement Guide that many patients complaining about hair loss, especially women exhibit signs of vitamin B12 deficiency. MedlinePlus states on its website that the deficiency may also cause anemia, leading to pale skin. Vitamin B12 (cobalamin) is normally obtained from food - only animal products - because the body does not make it on its own. A chemical in the digestive system helps the body digest and absorb vitamin B12. With aging, people lose some ability to utilize B12, and many people become deficient in this vital vitamin. MedlinePlus states oral supplements or monthly B12 shots may be recommended when adequate amounts cannot be obtained through food. A simple blood test can check your levels of vitamin B12. Overall, the entire suite of B-complex vitamins is essential for good hair and skin. In addition to Vitamin B12, vitamins B3 (niacin), B6 (pyridoxine) and B7 (biotin) are also critical for hair and skin growth and appearance. A balanced B-complex vitamin supplement provides the extra boost your hair and skin may need to look great. Antioxidant vitamins, such as vitamin C, A, and E, are also critical for healthy hair, skin, and nails. Antioxidants, such as Vitamin E, support healthy skin, hair and nails by fighting oxidative stress from free radicals. These radicals promote aging of skin and other cells, according to the National Institutes of Health. Topical and oral use of antioxidants help to improve damage to skin and prevent wrinkles. In addition to supplements, antioxidant vitamins are found in brightly colored fruits and vegetables such as blueberries, pomegranate and spinach. While it is considered safe to supplement with vitamin C at recommended levels, watch for high levels of vitamin A and E which are fat-soluble vitamins, which can build up to toxic levels in the body. In fact, according to an American Academy of Dermatology article, too much vitamin A can cause nails to become brittle and fragile. Biotin, also known as vitamin H or B7, is often used to treat brittle nails. A 2007 review in the Journal of Drugs in Dermatology states a daily biotin supplement appears to improve brittle nails. Adequate biotin also prevents hair loss. Most people get adequate amounts of biotin in their daily diet. Good sources of the vitamin include eggs, dairy products, Swiss chard, nuts, whole grains, and chicken. Scientists are discovering more of the benefits of the essential fatty acids each and every day. One benefit is to help build beautiful hair, nails, and skin. Omega-3 and omega-6 fatty acids have been shown to reduce inflammation and support healthy skin and hair according to the University of Maryland. Omega-3 fatty acids also support scalp health, and a deficiency in these fats can lead to dull skin and hair. You can also supplement omega-3 fats by taking fish oil or flax oil. You can obtain essential fatty acids from eating cold water fish, such as tuna and mackerel, taking krill or fish oil supplements, or adding these plus a flaxseed oil supplement. Zinc is a mineral, not a vitamin and contributes to the health of hair and skin cells. The National Institutes of Health writes zinc deficiency can cause hair loss. Zinc also builds the immune system and helps support overall metabolism. In addition to a supplement, good sources of zinc are oysters, red meat, poultry, eggs, dairy products, cereals, and bread. High levels of zinc in a supplement might cause stomach discomfort and decrease the effects of other nutrients in the body such as copper, iron and calcium. 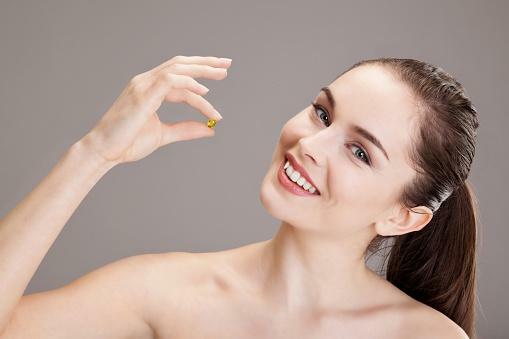 Doses of a vitamin for good hair and skin vary with age, gender, and health status. It's best to talk to your doctor, a registered dietician or nutritionist, or a natural health expert who can guide you as to which vitamins to take for glowing hair, skin and nails. You can get many of the recommended vitamins and zinc by taking a daily multivitamin. There are also supplements formulated specifically created to address skin, hair, and nails concerns. A good quality liquid vitamin with a balanced mix of essential vitamins, plus a fish oil or flaxseed oil supplement, may also add luster to hair and skin. Nature Made Multivitamin: You can get the vitamins you need for your hair, skin, and nails, except biotin, in this multivitamin that 100 percent of customers give high ratings. Buy biotin separately to complete what is recommended. Each multivitamin tablet contains 12 vitamins and minerals including vitamins A, C, E, and B, and the mineral zinc, and there are no preservatives added. Walgreens sells this product for about $19 for 300 tablets. Vitacost Hair, Skin & Nails Formula: This supplement contains a combination of 16 micronutrients to promote healthy skin, nails, and hair, including biotin, B-vitamins, vitamins A, C, and D, and zinc. Reviews are consistently positive and the product has a 4.4 out of 5 stars customer rating. The product costs about $11 plus shipping on the Vitacost website. Nature's Bounty Optimal Solutions Hair Skin and Nails: This multivitamin sells for under $5 for 60 coated caplets at Walmart. Each caplet contains 16 ingredients including vitamins A, C, B, and biotin for "lustrous hair, strong nails, and vibrant skin." The majority of reviewers rate the product 4 to 5 out of 5 stars. Andrew Lessman Healthy Hair, Skin & Nails: This 100 percent pure vitamin contains no fillers, preservatives, colors, binders, or lubricants. The supplement contains a blend of biotin and B-complex vitamins. Satisfied customers gave the product high marks for its ability to thicken hair, strengthen nails, and improve skin appearance. A bottle of 100 capsules costs about $25 plus shipping on Amazon. Vitamin Code Raw B-Complex: This unique raw organic fruit and vegetable blend supplement combines B-complex vitamins with biotin, folate, live probiotics, and a raw organic fruit and vegetable blend. The product enjoys a 4.9 star rating from The Vitamin Shop customers. A jar of 60 veggie caps costs about $15.50 plus shipping. Nature's Bounty Zinc Caplets: If you want to but zinc by itself, try these caplets containing 5 milligrams of zinc. They contain no artificial flavors, sweeteners or preservatives. Walgreen's sells a bottle of 100 caplets for about $7. Customers rate the product 4.8 out of 5 stars. Barlean's Organic Fish Oil: This organic fish oil supplement harvested from deep sea, cold water fish is infused with an orange flavor to prevent a fishy aftertaste. Each daily dose contains omega-3 and omega-6 fatty and acids. The product has a 4.5 out of 5 star customer rating on Amazon. A bottle of 250 soft gels (1000 grams each) costs about $20 plus shipping on Amazon. One thing that's important to note is that a sudden change in the appearance of hair or skin or sudden hair loss may be a sign of illness. Nail discoloration can indicate unhealthy nails caused by diabetes, anemia, or other serious diseases. Sudden hair loss combined with rapid heartbeat, insomnia, weight loss, and scanty menstruation in women may be a sign of thyroid disease, for example. Hair loss may also be due to stress, chronic disease, or many other illnesses. If you suddenly see lots of hair coming out every time your brush or shampoo, it's time to make a doctor's appointment. Healthy skin, hair, and nails reflect your overall state of health. Eating a well-balanced diet that contains a variety of foods is the best way to keep hair, nails, and skin healthy; however, vitamin supplementation can help give you an extra boost.